Do you want the good flora in your belly to be happy? Yes, probiotics need to eat, too! If you feed them, they will grow happier. And your gut ecosystem will be healthier. People with issues of constipation often see complete relief just by adding in prebiotics. What are prebiotics? Are they a pill? Prebiotics are food for probiotics! Here are 13 real food prebiotic foods to make your gut (and your entire body) healthier! As you may know, a healthy or healed gut allows many symptoms and health conditions to disappear. For overall wellness, let's embrace prebiotics into our daily diets. Don't overcook onions or leeks. The longer they cook, the fewer prebiotics they contain. These are yummy! Have you tried them yet? Most natural food stores carry them, sometimes sitting in a bit of water to keep them fresh. Eat them raw, sauté or roast them, or simmer them in bone broth and purée them into a soup base! They taste like a cross between potato and artichoke. For the greatest quantity of prebiotics, ferment or eat them raw. Yes, you can make homemade herbal coffee and get prebiotics! Try blending chicory root with coffee grounds before brewing — New Orleans style. With prebiotic qualities that increase when heated, sorghum is a gluten-free grain that's excellent for baking. Try these donuts for an easy way to add prebiotics to your diet. They're easy to digest (thank you, sourdough! 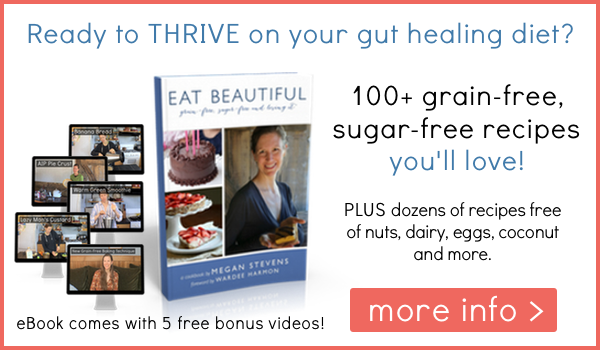 ), and good for your gut health (thank you, sorghum!). Add dried dandelion to your soups and stews to conveniently make them prebiotic. It's important to add the dandelion at the end to preserve more of its prebiotic qualities. And see my YouTube video to learn how to incorporate other lesser-used, nutrient-dense herbs in cooking! Are you ready for one more quality we can attribute to this superfood? Add it to your soups and stews — also at the end of cooking — for a prebiotic boost. Raw asparagus contains a significant amount of prebiotics, some of which are lost with cooking. But raw asparagus can be hard to digest. The solution? Ferment it. The nutrition in these spears will multiply and the prebiotics will remain intact. And, by eating a fermented prebiotic food, you're consuming both PRObiotics and PREbiotics at once. Bonus! These prebiotic foods contain resistant starch. Yet when cooked or fully ripened, this resistant starch vanishes, leaving bananas and plantains no longer prebiotic. So how do you make green bananas and plantains palatable? Make them into crackers! Or dehydrate the fruit into cookies. Cassava flour, when cooked and cooled, contains a different kind of resistant starch — called RS3. I love making muffins with cassava flour. Here's my Paleo Winter Squash muffin, and a Grain-Free “Bran” muffin, both of which contain prebiotics. These goodies are one of the best sources of resistant starch. As with cassava, the RS3 starch forms when the veggie cools. Potatoes can even be reheated again and still retain their prebiotics. Potato salad and my Resistant Starch Smashed Potatoes are great ways to enjoy them. Who knew white rice was a health food? Even when stripped of its bran and neither soured or sprouted, white rice has health benefits to offer. Cooked and cooled rice offers a world of creativity: rice pudding, rice salad, sushi rice (just substitute white rice for brown)… The list goes on. Cooked rice, like potatoes, keeps its prebiotics even when reheated. It also contains RS3 starch. Dive into cooked and cooled white rice and enjoy the prebiotic benefits! Beans, like rice, are cooked and cooled to obtain RS3, a retrograded starch that remains even when reheated. Make sure to soak your beans before cooking, though! Bean salad, reheated refried beans, and bean soup leftovers are all wonderful ways to incorporate more prebiotic beans into one's diet. Apple cider vinegar not only has prebiotics from the pectin it contains, it classifies as a bonus prebiotic (in my book) because it assists the conversion of resistant starch to butyric acid, or butyrate. 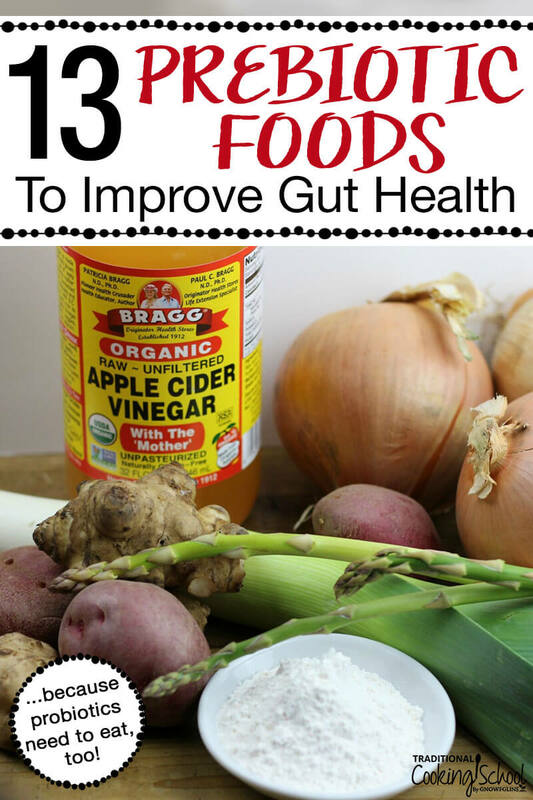 Therefore, eating any resistant starch food with apple cider vinegar, (such as German potato salad), only benefits the process of feeding your good gut flora. What prebiotic foods do you already eat? Which ones will be the easiest to add? Will you be more mindful of eating prebiotic foods in the future? What do you think about Tiger Nuts and Tiger nut flour? TigerNuts are great! They could easily have been #14! 🙂 Here’s my favorite grain-free muffin recipe using TigerNut flour, which, yes, is very high in resistant starch. Thanks for asking! http://eatbeautiful.net/2016/01/17/tigernut-bran-muffins/ The recipe goes into more detail about what form to eat the “nuts” or flour in to get the RS benefits. Hello, i am learning sooooo much from you, thank you. Upon reading about prebiotics in cooked and cooled beans…does the same hold true for caned beans as long as they were prepared correctly before caning (like caned baked beans for example) thank you in advance for your time. Hi Amanda, such a good question! Yes, the same does hold true. Canned beans do contain resistant starch. Is the resistanse starch in plantain or banana flour palatable? Before you make the plantain flour you first dry the green plantain. Hi Andrisa, good question. No, it’s not. Folks try to hide the flavor in smoothies. However, cookies and crackers, made with pureed green plantain, are great tasting. It’s just the flour that’s not good tasting. Thank you. Actually just what I need and easy to do.